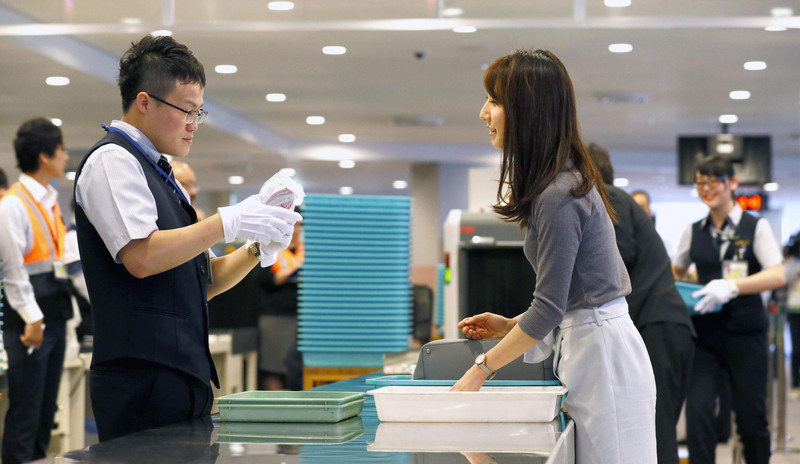 Major airports in Japan are struggling to retain luggage inspectors due to low wages and long hours, leaving authorities concerned about anti-terrorism efforts ahead of the 2020 Tokyo Olympics. With the number of foreign visitors to Japan expected to continue its trend of record annual rises, in line with government policy and the expansion of low-cost carriers, Japanese airports have been planning further physical expansions. Besides the Olympic and Paralympic Games in 2020, Japan will also host the 2019 Rugby World Cup. But the country’s aviation workforce, which plays a crucial role in preventing attacks, is not immune to the labor shortages caused by the declining working population. “We are facing a serious issue, where 20 to 30 percent of safety officers who are working on the front line of airport security are leaving,” said Makoto Natsume, president and chief executive officer of Narita International Airport Corp.
“Ahead of 2020, how to secure the labor force in terms of both quality and quantity is a serious issue,” Natsume told a recent conference of Asian airport operators. He stressed that the cargo sector is also experiencing a labor shortage. Designating tourism as a key growth area, the government aims to attract 40 million visitors from overseas a year by 2020, and 60 million by 2030. A record 28.69 million non-Japanese visited the country in 2017, up 19.3 percent from the previous year and the sixth-straight yearly rise. The number is expected to top 30 million this year. Meanwhile, of around 940 staff who worked as safety inspectors at Narita International Airport, Japan’s main gateway to the world, as of April 2016, more than a quarter — or some 240 — have left the job, according to Narita International Airport Corp.
Data from the transport ministry also show that while airport users rose by around 40 percent to 184 million in the five years through 2016, the number of airport workers has not risen, staying at around 40,000. For fiscal 2017, job availability for the security sector was 6.27, the Health, Labor and Welfare Ministry said, meaning a ratio of 627 job openings for every 100 workers. The ministry, citing hearings with nine airline companies, said harsh labor conditions and low wages are behind the unpopularity of security inspector roles at airports. According to a monthly survey released by the labor ministry, in a security-related workplace of at least 30 employees, including security inspectors, monthly wages averaged ¥235,000 in fiscal 2016, around ¥127,000 lower than the average across all industrial sectors. Monthly labor time was some 168 hours, over 19 hours more than the average. One reason wages are kept low is that airline operators outsource recruitment to inspector companies. As competition to win airport orders is severe, companies bid low, analysts said. “I want to reduce the number who quit the job by improving their labor conditions, but we cannot do it by one company alone. The airports as a whole need to recognize the importance of inspectors,” said a senior official at an inspector company. Narita has taken steps to address the high attrition rate, such as enlarging the child-care facility within the airport to entice female workers to stay, while contests to improve security inspection skills have been held to boost motivation. “Advances in technology and robotics may make up for labor shortages, but in the end it is the power of people who can offer customers safe and comfortable services,” Natsume said. The number of landings at Japanese airports reached 1.19 million in fiscal 2015, an increase of nearly 20 percent from 2011, according to data from the transport ministry. The labor-intensive nature of the airport sector — with 24/7 operations — makes employment there less attractive, but with airports enlarging facilities and air travel set to rise further, many are calling for revamped efforts to retain labor. “We have to be more dynamic … we have to sell aviation and that’s to the benefit of air traffic controllers, pilots, airlines and airports all across the globe. We have to be more effective in going out and getting people,” said Andrew Herdman, director-general of the Association of Asia Pacific Airlines. In Hong Kong, they have attracted talent by setting up training facilities that offer an aviation-related curriculum designed to nurture professionals in airport management, security and aviation services, said Vivian Cheung, president of the Hong Kong International Aviation Academy. The academy was started in April 2017 to attract local people to work for Hong Kong International Airport, which is expanding, including the construction of a 3,800-meter third runway. The project is expected to add more than 120,000 jobs to its current workforce of about 73,000, according to an official with the airport.